Argyle Feed Store is your one stop shop for all of your deer feeds this deer season. We have a huge selection of Purina deer feeds and supplements including the Purina Deer Chow Block. The Deer Chow Block is a 20% protein supplement that has been formulated to increase the amount of nutrition in a deers diet by supplementing the forage in the deer’s natural habitat. If you are looking to help your deer reach their full genetic potential, then the Deer Chow Block is the correct product for you. This product will help increase the size of the antlers and overall mass of your deer. 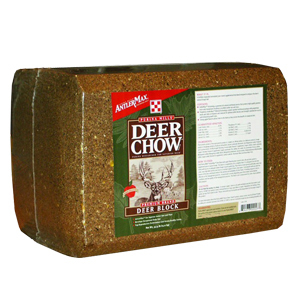 In addition to helping the deer grow, Deer Chow also tastes great so you can be sure that your deer will eat it up. If you would like more information on the Deer Chow Block, including a complete nutritional profile of this feed, then please click here to view this product on our website. Here at Argyle Feed Store, our commitment is to the customer. If you are having trouble finding anything or if you have any questions about the products that we offer, then please click here to visit our contact page. We will be more than happy to assist you in every way that we can.